What a striking image! 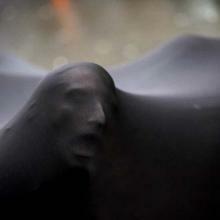 Please tell us a little of the backstory of the image. Thanks, Ross. It was truly just "the right time, the right place" kind of thing. I've covered a lot of hurricanes over the past 37 years and this was truly an odd storm. As the storm approached, News & Observer photo boss Scott Sharpe asked me where I wanted to be placed and I picked Buxton because of the road issues over the past couple of storms. Hwy 12 has been destroyed several times in the last decade and there are almost no photos from the island available except for aerials. So my thinking was: let's stay on the island and see what happens. I reserved a room at the Comfort Inn at Buxton and started shooting as soon as I got there. 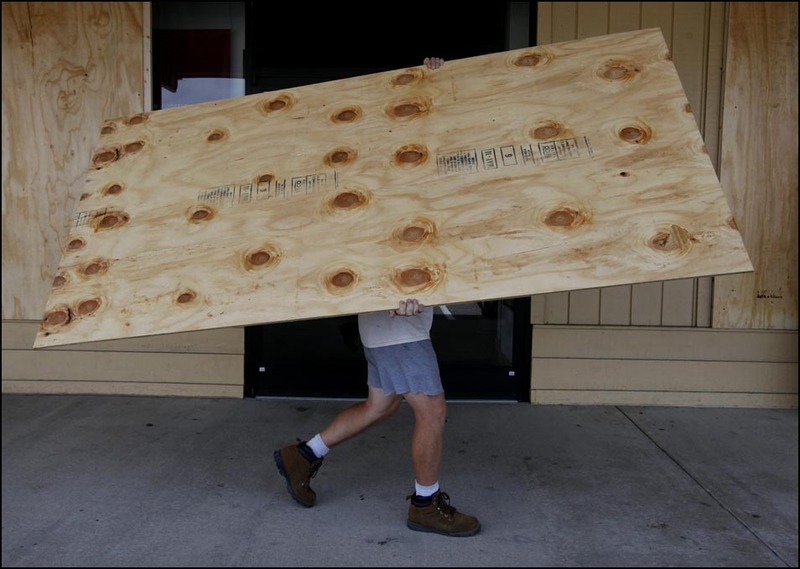 People were preparing late into the night putting up plywood, moving cars - that kind of stuff. You've covered a lot of storms like this. How do you prepare yourself mentally? not to do anything stupid, because I HAVE done some stupid things in the past which scared the crap out of me AFTER I realized how dangerous they were. Mentally, the main thing I always worry about is becoming part of the problem. I think the worst thing you can do as a journalist is to get into a situation where emergency resources have to be tasked to save you from yourself. On Friday morning, the storm was still twenty four hours out but I went cruising around to see what was happening. Another shooter had invited one of the housekeepers (she was a Russian exchange student who was very interested in photography) from the hotel to ride up to the Frisco pier to see what the waves were like. 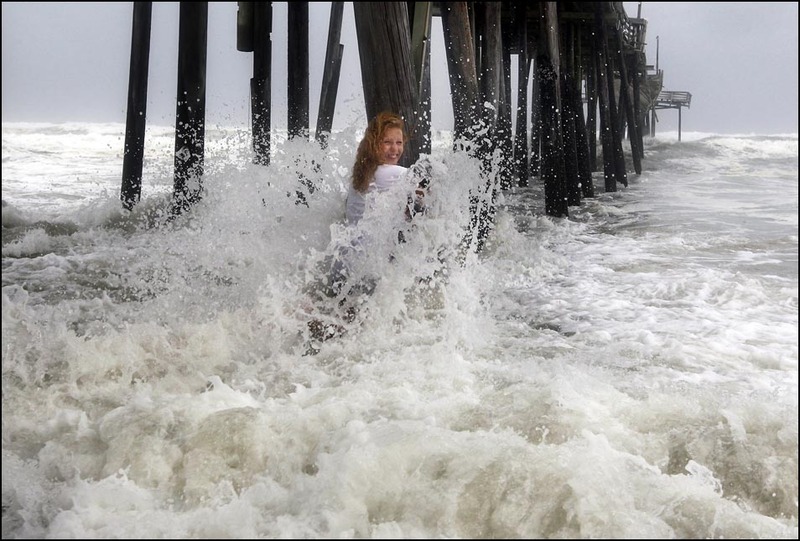 She was goofing off under the pier when a rogue wave came in and she almost got knocked down. I decided this was a spot I wanted to return to when the storm came in. I turned off the main road towards the parking lot for the pier and saw a white van through the houses. I knew there was a breech in the dunes there and said to myself, "What in the hell is that van doing up there? That's not a good spot to be." When I rolled into the parking lot there was also a Jeep Cherokee 15 feet away from the van and three people were frantically running around. The dune was breached and waves were actually coming through the break and flowing under the van - sand was already up to the middle of the tires. I thought to myself these folks are screwed. I made sure my vehicle was safe and when I got out, they were all screaming at each other and even though the wind was howling, the air was blue with profanities. The man in the Cherokee was screaming at the woman who owned the van to leave it, he had made a half-assed attempt to tow her out with a rope but he didn't line up the vehicle properly and he broke the rope several times. The second woman was screaming the whole time, "Let's leave her and get the f$%k out of here while we can." I had a tow strap in the back of the truck and offered it to the guy which he took. He made one more try of towing the van out but by now water was so high under the vehicle he couldn't find anything to attach the hook to. A couple more minutes of profanities hurled back and forth between them and he jumped into his vehicle with the other woman and started backing through the parking lot at a high rate of speed. I was somewhat shocked at this turn of events. The woman was pretty frantic and said all of her personal belongings were in the van, but at this point nothing short of a heavy duty tow truck was going to free it from the clutches of the sand and the water. She started running back to the road where the Cherokee had stopped. I started running in front of her shooting photos. 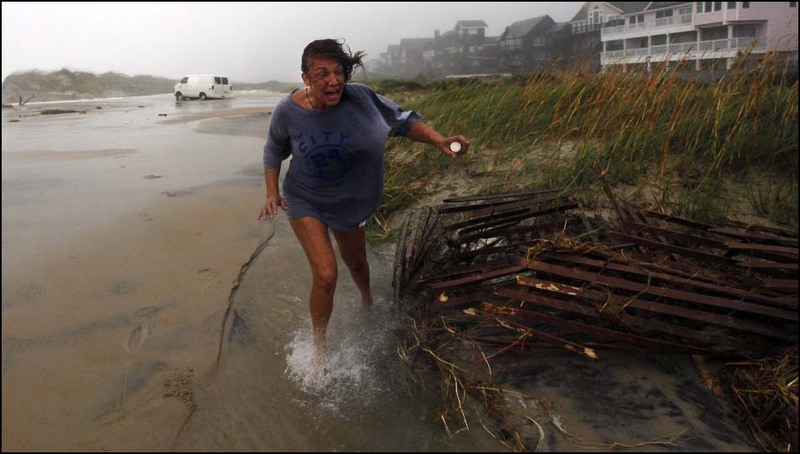 The image of the woman running was shot as the brunt of the storm arrived at Hatteras. My wind gauge had the sustained wind at about 76 mph with gusts over 85 mph - that's pretty strong. The hotel was packed with locals, emergency crews on standby, and electrical crews. A lot of folks were milling around in the parking lot and I made a few photos there. I wanted to see if the pier was still in place since the surf had been really high for 24 hours by now; as I remember it was also high tide. So I jumped into the huge rental truck I had and slowly made my way toward Frisco. I wasn't the only one on the road. There were more people than you would expect, but of course these people live out there and this was just business-as-usual for most of them. The main problem was the wind. 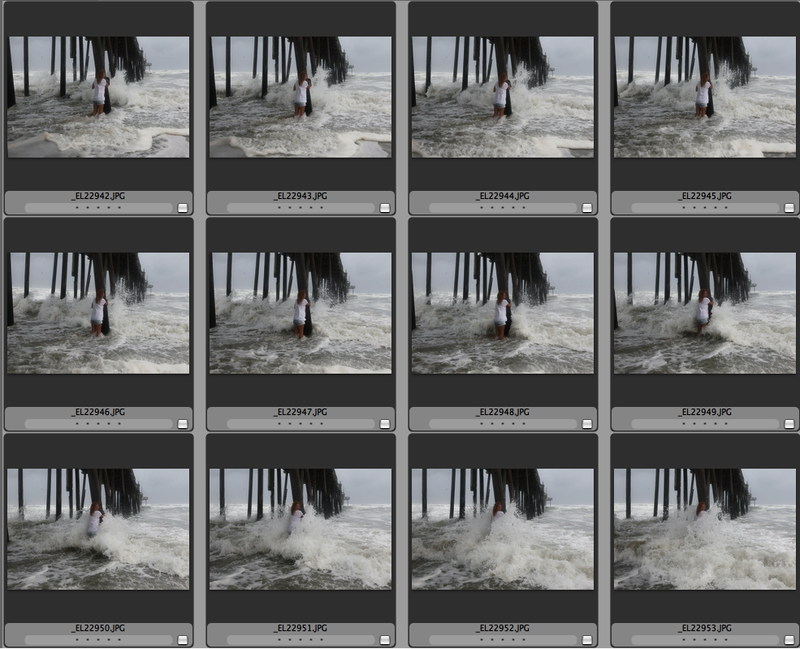 You can cover your camera from the rain and shoot with your back to it but the wind will knock you down. Also sand traveling at 70-80 mph is quite painful on exposed skin. I made sure I always parked with the wind on the opposite side of the truck. You do not want to open the door with wind like that blowing. It will tear the door off the vehicle and then you're screwed. 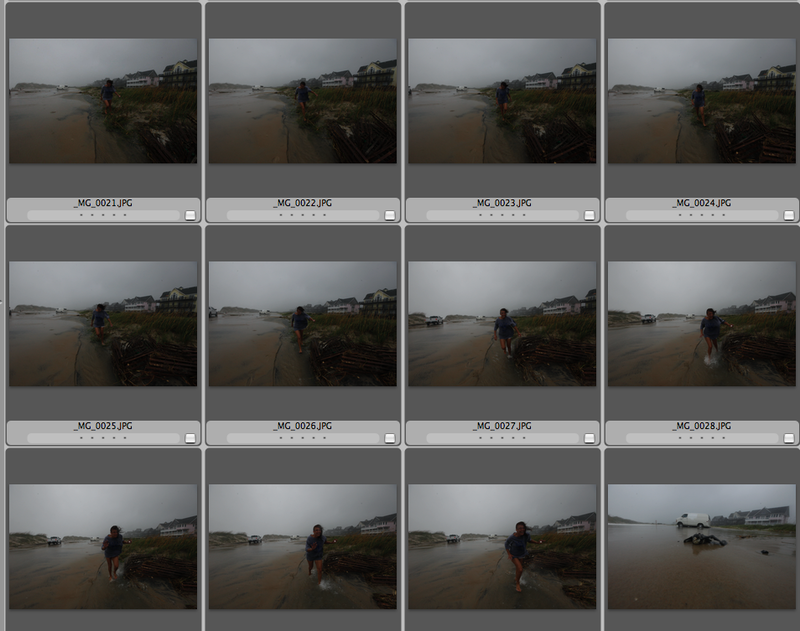 As far as the rain and sand, I use a different combination of things to keep the camera protected. And yes, I did say ONE camera: it's foolish to try and use two cameras in those situations. I also wear a pair of military sand goggles I got when working in Irag and Afghanistan, they look pretty goofy but at least you don't get blinded by sand particles. Rain coat and rain pants also. Although the rain pants don't work so great when the wind rips one of the legs off. Then you just have to hope you actually see a photo. I totally did not expect her "friends" to leave her there. I thought I would be shooting the frantic situation of them trying to free the van. I was more than shocked when she started running against the wind back to her friends who, it turned out, were waiting for her on the driveway to the pier. It also helped that the wind, sand and rain were at my back and I was able to keep the front element relatively clean. I was very lucky. Sometimes going the extra mile works out. I would have had a couple of photos had I stayed around the hotel, but I had a feeling there might be something else out there. My instincts are pretty good most of the time... except when they're not! When covering storms like this, be prepared the best you can. But you have to realize that sometimes no matter how prepared you are, things go south no matter what you do. I would like to give a big thanks to one of the staffers at your paper, photojournalist Steve Earley. I didn't have access to a SAT unit when I left for Hatteras. Frankly, we didn't think we'd need it since the cellular network hadn't gone down out there during a storm in years. It did about an hour after I transmitted the photos that evening. We lost power and all cell phones. Steve had a SAT unit and helped me the next day get photos back to my paper. Always have a Plan B. And a Plan C isn't bad either. But most of all stay safe. 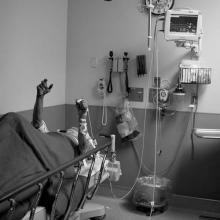 No photo is worth getting injured or killed over. Chuck Liddy, 58, has been a staff photographer for The New & Observer for 19 years. Liddy, in a career that has spanned 38 years has been published in most major newspapers around the world and a list of magazines including Time, Newsweek, People, Sports Illustrated , ESPN-The Magazine, National Geographic for Kids, and Stern among others. Liddy has covered a variety of assignments over the years which included dozens of hurricanes including Fran, Katrina, Floyd and Irene. Liddy has spent extended time in the last decade covering the wars in Afghanistan and Iraq. He was also sent to document relief efforts in Haiti after the 2010 earthquake. He has been awarded over a hundred photojournalism awards during his career including being nominated by his newspaper for the Pulitzer Prize three times. He has been a resident of Durham, NC for over 25 years.